Food manufacturers can no longer use seven synthetic flavors that have been shown to cause cancer in animals, the U.S. Food and Drug Administration (FDA) ruled on Oct. 5. The chemicals, which may also cause cancer in humans, add flavors such as mint, cinnamon and citrus to everything from baked goods and alcoholic beverages to candy and ice cream. The FDA revoked its approval of the synthetic flavors after Earthjustice asked the Ninth Circuit to force the agency to take action. The additives are labeled simply as “artificial flavors” on ingredient lists. Since the agency first approved these ingredients in the 1960s, scientific authorities like the U.S. National Toxicology Program and the World Health Organization’s International Agency for Research on Cancer have linked them to cancer. In our request to the Ninth Circuit, we represented a wide range of organizations, including the Center for Environmental Health, Breast Cancer Prevention Partners and Center for Science in the Public Interest, which petitioned the FDA to revoke its approval for these seven ingredients in 2015. Congress requires the FDA to move quickly on any petition concerning food additive safety. After years of inactivity on the petition, we asked the court to require the FDA to act on its 2015 request. Now the FDA has ruled in our favor. 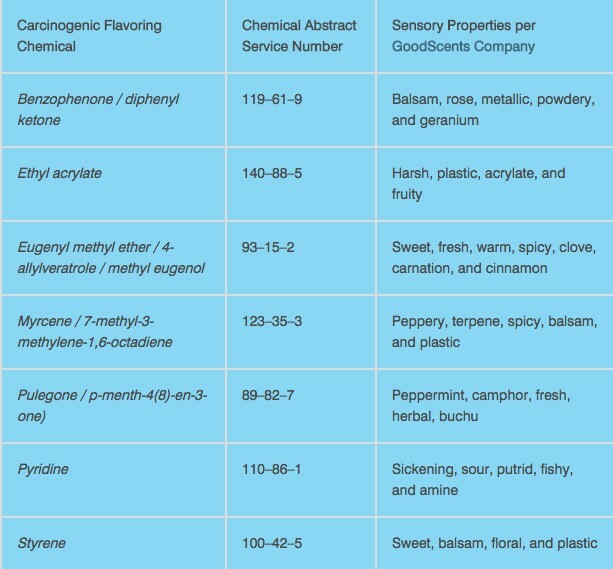 The seven carcinogenic food additives and the flavors they contribute. Click here to open a larger version. “Though it is unfortunate we had to resort to litigation to get FDA to act on the food additive petition, it is gratifying that FDA ultimately made the right decision to protect public health against these carcinogenic flavors,” says Carrie Apfel, Staff Attorney at Earthjustice. Earthjustice argued that statutory language in the Food, Drug, and Cosmetics Act required the FDA to withdraw its approval of these flavors given the evidence that they are carcinogenic. The FDA based its decision to revoke its approval of six of the seven flavors on this reasoning. For the seventh flavor, it revoked its approval based on industry representations that food manufacturers had abandoned use of the chemical in food. The FDA’s decision is effective immediately after publication of its notice in the Federal Register, barring objection from industry. It then allows two years for industry to reformulate its products before the FDA will begin enforcement. Carrie Apfel is a staff attorney in the Sustainable Food and Farming Program. She is based in Washington, D.C.